Worship songs have always been a part of Christian music history. From songs like “Better is One Day”, “Our God”, “He Reigns”, “Above All”, “Here I Am to Worship” and “How Great is Our God”, to “Hosanna”, “Mighty to Save”, “Holy is the Lord” and “Happy Day”; worship songs throughout the last few decades have always been some of the greatest songs ever to be made within Christian music. Knowing me as a CCM/worship music lover, every time a new worship album releases from any artist, I am excited, or at the very least intrigued. And yet with so many album releases and so many worship songs out there in the world, I can often be overwhelmed with the amount, and how after a while, some bands sadly sound similar to each other and within a whole heap of songs, comes not that much originality. Nevertheless, there are always great worship artists to be found within the list of endless amounts of worship leaders around the world- from Crowder, The Sonflowerz, Phil Wickham and Chris Tomlin, to Joanna Beasley, Matt Maher, Audrey Assad and All Sons and Daughters. Enter in Jordan and Kristin Rippy, a duo who also fall in the category of great worshippers and worship artists- the kind of artists where you’d purchase the album from the advice of friends, even without hearing it yourself. Since streaming the album on bandcamp the other day, I have thoroughly enjoyed this 6 song EP, which has quickly usurped every other EP to become my favourite EP of 2014 so far. With Jordan and Kristin dividing the vocal duties in half (Jordan leads in three tracks, Kristin in the other three); we are given a great treat in witnessing both Rippy’s lead and showcase their vocal strength. With Jordan lending his voice to “Glorious Sound”, “Come Like the Wind” and “Come and Drink”, the Rippy’s unveil a vocalist that arguably could be the best new male voice to come out of Christian music since David Leonard in All Sons And Daughters. The first single from the album, “Come Like the Wind” brings us an acoustic music backdrop as Jordan brings forth a track that starts out in a mellow and subdued manner, while bringing with it an anthemic feel as the song progresses. With a vocal reminiscent of artists like Tim Hughes or Ben Cantelon, Jordan unashamedly declares out for God to ‘…come like the wind, come like a fire, burn in our hearts, our one desire, we wanna know You, God, we wanna know You, God…’, and brings to the attention of listeners a track that is perfect in places of worship, in both a corporate and individual setting. With the songs (not just this one) having a ‘Bethel’ atmosphere (which is interesting, considering that the EP is produced by Gabriel Wilson, who produces a fair amount of Bethel material- maybe it is Gabriel that makes the Bethel signature sound? ), “Come Like the Wind” is a welcomed standout on Seek You First. “Glorious Sound” is possibly the most radio friendly and upbeat song on the album, and from first guitar strum, you’re instantly hooked in (at least I was). With the instrumental introduction reminding me of the guitar intro in Jonathan Lee’s “Pouring it Out For You”; we are met with a theme of us longing for God to show up in our lives with a glorious sound that God makes, in whatever way, shape or form it may be. As Jordan cries out the encouraging words of how ‘…we wanna see Your face, Lord, we wanna see the lost be found, we wanna see this city rise and make a glorious sound…’, “Glorious Sound” becomes the powerful life-changer that it is as we as children of God declare alongside Him, both in our hearts and collective as family and friends, longing for Christ’s continual presence. With Jordan also bringing to the EP table the last song “Come and Drink”, a moment of realisation in which we come to the river of God’s love and drink in the healing and hope it provides, these three songs encapsulate Jordan’s skill and assert him as one of the male vocalists to watch for in the rest of 2014! 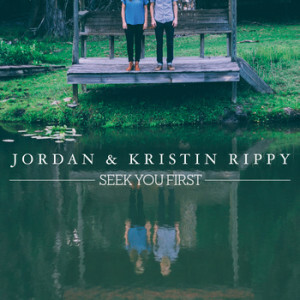 Kristin Rippy, the other half of the duo, presents the remaining 3 tracks, and together with Jordan’s vocal strength, make this album one of the most enjoyable experiences out of any album release in 2014 so far (aside from Francesca Battistelli’s If We’re Honest and MercyMe’s Welcome To the New). Starting off the album with the title track, “Seek You First”, this joyful, lively and electric guitar driven melody brings all kinds of happy feelings to the fore as Kristin sings about seeking God ‘…with my whole heart…’ A song to start off the album as we listen to feelings of longing for God even more than before, Kristin’s start to the album and the songs she’s singing is great as we hear also one of the most unique and powerful female voices in worship music that have released something this year so far. Ending Kristin’s contribution with “Spirit of God”, a 6 and a half minute song that sounds very Bethel-esque (I could imagine Jenn Johnson singing this melody), and presents a theme of us longing for God to envelop us with His Spirit and ‘…come like You promised, come fall on us, come make us new…’; both Jordan and Kristin have presented to us an almost faultless EP (the only downside is that it’s too short) and one of my standouts out of every EP and album release in the year so far. While indie, their sound is nevertheless still great, and one to certainly listen to on a day of reflection, or even a day of exaltation. Perfect for both corporate and individual worship, these songs are so great that I reckon churches ought to latch on them and sing them in their churches sooner or later- hopefully they do. An album I’d recommend to any worship music buff (like myself), Seek You First is a great standout album, and my favourite album release in June 2014 so far.